When it comes to your career, sometimes there are giant, flashing neon signs that yell out to you the need to get a new job. There are just so many red flags that it is quite obvious it is time for you to move on. There is a long list of reasons to leave your current job. For example, you hate your boss or you have been skipped over for a promotion yet again. Either way, these are painful reminders that it is time to pad the resume. But there are other times when you need to seriously consider a change in scenery, only the reasons are not quite as obvious. In fact, you might be missing them altogether. 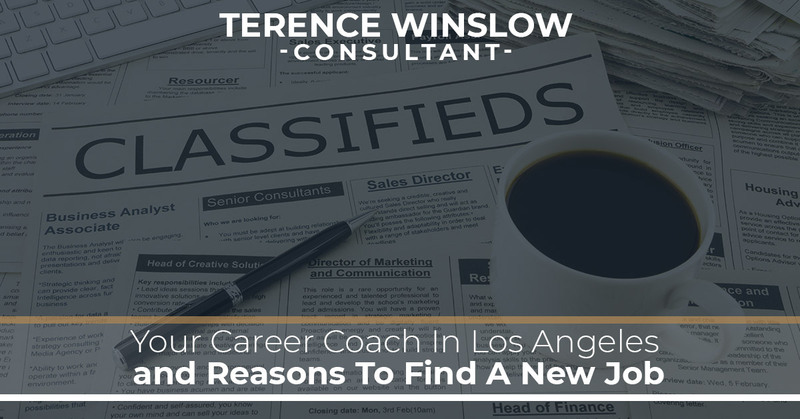 Terence Winslow, your career coach in Los Angeles, offers the not-so-obvious reasons you need to look for a new job. We all have daydreams about winning the lottery, throwing the game-winning touchdown in the Super Bowl and dating a supermodel, so it doesn’t seem out of the ordinary to dream about the perfect job. After all, you haven’t really given it a whole lot of thought and have never taken steps to make it happen. You need to consider that if you are dreaming about it, you might not be really satisfied with your current job. If you have even entertained the thought of jumping ship, maybe you should listen to your subconscious. There are very few people who wake up Monday morning eager to start the workweek. And nobody is thrilled to have to go to work every day. But if you can’t remember the last time you felt enthusiasm for any work project, that’s got to be a problem. It’s unreasonable to feel enthusiasm every single day, but if it never happens anymore, then perhaps you need to move on to greener pastures. If the smallest annoyance inspires an eye roll and audible groan, it could be time to change jobs. You could be the office Debbie Downer and not even realize it. If you are less irritable over the weekend, we think we know what is causing your emotional dip. Time to consider a new job. You have been at your current position for a few years and every day looks pretty much the same. You aren’t ever really challenged, your boundaries are never pushed and you never get new assignments. In fact, nothing has changed since your first day on the job. It is one thing to feel confident and comfortable in what you do. But when you feel like a hamster on the wheel going nowhere, that is a problem. If you are stuck in neutral, it is time to consider your career options. There is a fine line between red flags that indicate you need a new job and normal work grievances. Call Terence Winslow if you need mentoring and coaching.